Over in the States, ABC News' Nightline programme has a fascinating story: that a company with a multi-million dollar contract with the US Department of Defense has been adding secret biblical references onto the sights for high-powered military rifles. In August of 2005 Michigan-based company Trijicon started to provide up to 800,000 of its Advanced Combat Optical Gunsight (ACOG) to the U.S. Marine Corps. According to Trijicon, the ACOG is "ideal for combat due to its high degree of discrimination, even among multiple moving targets." At the end of the scope's model number has been added "JN8:12", a reference to the New Testament book of John, Chapter 8, Verse 12, which reads: "Then spake Jesus again unto them, saying, I am the light of the world: he that followeth me shall not walk in darkness, but shall have the light of life." The ACOG is widely used by the U.S. military. 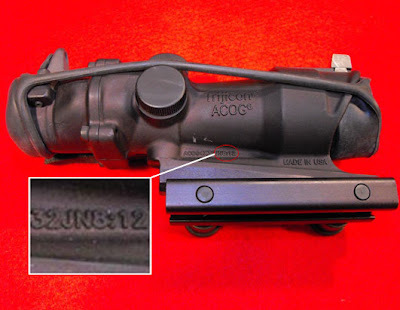 The company's Reflex scope, meanwhile, is imprinted with the marking "2COR4:6", a reference to the second book of Corinthians in the New Testament, Chapter 4, Verse 6: "For God, who commanded the light to shine out of darkness, hath shined in our hearts, to give the light of the knowledge of the glory of God in the face of Jesus Christ." See the Military Religious Freedom Foundation's press release for more.